The late Dr J.N.L. Myres was the first person to suggest it would be possible to obtain information from pot stamps, other than as a pure decorative medium, in Antiquity (Vol. XI: 1937). Since the AASPS was set up in 1981, it has become possible not only to trace distribution of the less common types of motifs, but also to attribute them to specific areas, families or tribes. Thus what in the past was not considered of much use is now proving to be an important part of the understanding of the Anglo-Saxon peoples. The AASPS is always available for consultation, but most people working on stamps will consult local and national publications in the first instance. This makes accuracy in these sources extremely important. 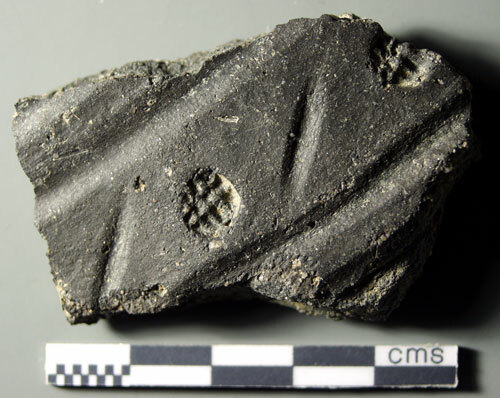 The AASPS's policy for recording motifs is to treat every stamped sherd with a different museum number or context number as a separate example of the motif. There are occasionally examples where the decorative scheme makes it highly likely that two sherds are from the same urn, but unless the excavator has identified them as from the same urn, the AASPS will record the sherds as separate items. The possibility of the two sherds being from the same urn is recorded on the cards as an additional comment. 1. Cut off, or tear off a portion of the clay and knead well until it is smooth and plastic. 2. Roll it flat with something round – a large felt-tip pen, glue-stick, etc – until the piece to be used is about 2–3 mm thick. 3. Trim off the edges with a knife, then cut off a square or rectangle large enough to cover the stamps you wish to record on the pot or sherd. 4. Press the clay gently, but firmly, into and over the stamp(s). 5. Peel off the DAS keeping it as flat as possible, and put it somewhere to dry on a flat surface. You can gently press down the edges to flatten it. 6. Check the cast after about an hour and turn it over when it has started to dry – the cast will go white at the edges – to ensure that it dries flat. Again you can press it flat very gently. 7. If any of the clay is left on the pot or sherd, it can easily be removed with a wet sponge. The drying process will take between 4 and 12 hours depending on heat and moisture in the atmosphere. On no account should the cast be dried in heat as this will cause shrinkage. Any pieces cut off and not used can be kneaded together and used again. The clay does not have harmful effect on the pot surface. The DAS cold clay will keep for a long time, providing that only small quantities are used at a time and the rest is stored in a plastic bag from which the air has been expelled and which is sealed with a tie. It is important that a separate cast is taken of each motif because these casts will be filed on individual cards. When the casts are not stuck on the cards, the museum number or other reference should be written on the back before it is sent to the Archive. The only exceptions are A 1ai and D 1ai stamps. Where these are found, please fill out a card, but don’t bother to cast it unless the stamp appears to be unusual. If in doubt, cast it. 1. The LINEAR DEFINITION METHOD, which uses shading to denote depth. This method is used in Myres’ A Corpus of Anglo-Saxon Pottery of the Pagan Period. 2. The POSITIVE/NEGATIVE METHOD, where the depressions made by the die are drawn in black and the pattern remaining on the pot surface is left white. This method is used by Dr C. Hills in The Anglo-Saxon Cemetery at Spong Hill, North Elmham (Vol. I–IV). Neither method is perfect, but the second is generally preferable, particularly for drawing concentric line stamps. If the first method is used, the depth shading is lost in publication and it is often impossible to tell the number of positive and negative circles a stamp may have and so compare it with other pots in the same cemetery, and with pots from other sites. These remarks apply equally to rectangular (C), triangular (E), diamond (F) and horseshoe-shaped (G) motifs with concentric lines. There are also times when it is not possible to show the depth of a stamp, or its shape (e.g. cone or pyramid) by the positive/negative method. In such cases, it is better to use the linear definition method. • Every motif should be illustrated and placed separately from the drawing of the pot. • Each stamp should be shown in illustration as 1 : 1 (i.e. life size). • The exact measurements should be recorded as width x height. • Non-circular cruciform stamps should be measured along the cross arms. It is also important to show whether the cross is upright, even if it is placed diagonally on the pot, or a diagonal cross, which cannot produce an upright impression. A particular hazard for illustrators is the 'rogue' stamp which may have been introduced at the end of a line of stamps or at the bottom of a chevron. Sometimes this is a stamp which appears to be of the same type and size as the others but, for example, a rosette stamp may have a different number of petals. The question of identical stamps has been investigated by Dr C. Arnold in some depth, and it has become evident that Anglo-Saxon potters must have owned several dies with the same motif, and in different sizes. However, stamps which appear to be visually identical, may show small differences in the cut of the die if examined by microscope.